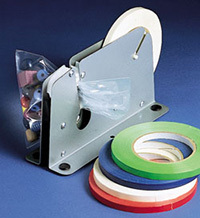 3/8" colored adhesive tape for sealing flat poly bags. A handy tape dispenser is available too! Regular and reinforced paper tape with water activated gum adhesive. 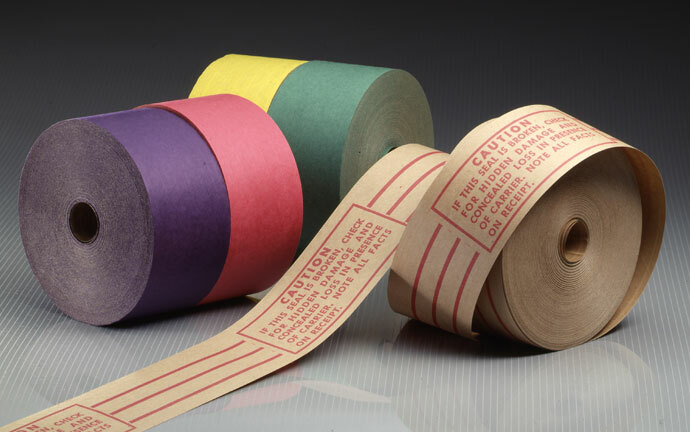 Reinforced, water activated gum adhesive paper tape in multiple colors. This gummed tape is also available in a tamper evident, pilfer proof style. 3M pressure sensitive adhesive carton sealing tape. Three varieties available: economical, all purpose and extra strength. All three varieties are available in tan or clear packing tape. Water activated gum adhesive paper tape that can be custom printed to your specifications. We have dispensers for all styles of tape: pistol grip packing tape applicator, gummed tape dispenser and for our bag sealing tape.